Perhaps the most oft-quoted bit of Caribbean cruise port trivia is that the island of St. Maarten/St. 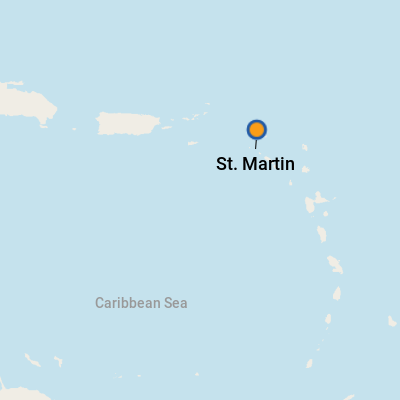 Martin is the smallest occupied by two sovereign nations. Though snuggled together in a scant 37 square miles of mountainous terrain, these two countries maintain distinct identities. The Dutch side (St. Maarten) is home to large resorts/casinos, bustling beaches and tons of get-it-cheap, duty-free shopping, while the French side (St. Martin) features quaint bed and breakfasts and luxurious resorts, laid-back beaches and the charm of local artisans at the waterfront market. Although St. Martin is the larger hunk of the island, it draws far fewer visitors. Some smaller ships call on Marigot, St. Martin's capital, but the majority of lines dock on the busier side of the island in Philipsburg. It's simple and economical to make a cab trip from the Dutch side to St. Martin, especially for those who wish only to spend some time in Marigot. One major draw is the shopping. There are bargains to be found, and St. Martin is duty-free for the most part, but Marigot attracts those who seek couture and upscale imports from France. Boutiques there fit the bill, reminding many of a more down-to-earth version of St. Barts. St. Martin also offers cafes, bistros and brasseries ... most serving up tasty creations with Gallic flavors and panache. St. Martin has some of the prettiest beaches in the Caribbean, with assets to please everyone: families, snorkelers, romantics and those who like to catch some rays wearing nothing but SPF 50. The Port of Marigot is right in the heart of Marigot, so the terminal contains few services. This is also where ferries to Anguilla depart, so there is a place to stash your luggage, if you are on one of the few cruises that embark/debark in Marigot. Most larger cruise ships call in Philipsburg, on the Dutch side. If you're debarking in Marigot, you'll be within a few steps of the Marigot Market, restaurants and several attractions. Serious shoppers could spend a half day just poking around the downtown. Tourists tend to be robbery targets, so don't flash valuables or cash, and don't leave anything of value in a car or on the beach. By Taxi: Cabs wait at the port to take you where you'd like to go. On Two Wheels: For the visitor who has been to St. Martin before and wants to explore at a slower, more in-depth pace, consider a bicycle or moped (although you need to watch out for Marigot's sometimes heavy traffic). You can rent one from Eugene Moto in Sandy Ground (Route de Sandy, Marigot; 590-87-13-97). Be sure to ask for maps and suggested routes. On Foot: Everything you could possibly want is within a few feet of the terminal, including shopping, a market, dining, ATMs and Internet services. Renting a Car: The Port of Marigot features several rental car agencies, including Lucky's Car Rental (luckys.car.rental@wanadoo.fr), Keith's Car Rental (keithcarrental.reservations@orange.fr), United with Claude Car Rental (ucr@sxmtrans.com), A&K Car Rental (ak.carrental@gmail.com) and other local companies. Marigot offers many fine choices, but Grand Case, a scant five miles or so north, features 27 fine restaurants packed in a one-mile stretch, earning it the nickname "restaurant capital of the Caribbean." Traditional French cuisine, local seafood and Caribbean favorites are the calling cards. In Marina Royale: At the marina, you've got several great options, from the Mediterranean-leaning La Belle Epoch and the Creole and Caribbean flavors of La Petite Auberge des Iles , to the fine French creations of uber-chef Cecile Briaud-Richard at Le Chanteclair . Upscale and designer fashions from the many luxury shops and malls sprinkled throughout Marigot make nice mementos. Whether you're looking for perfume, crystal or the latest fashion trend, the duty-free shops in St. Martin make taking home a souvenir for yourself a decadent exploration. You can also pick up some original artwork from one of many local artisans. Enjoy a glass or bottle of French wine or Champagne pretty much anywhere in St. Martin. You'll never see a better selection outside of France.